RAINBOW STARS are perfect gifts for Art Teachers, Science Teachers, your Hairdresser and others who love bold, bright color. They are also great as a Gay Wedding Decoration, Wedding Favor, Bridesmaid Gift, Host/Hostess Gift, Employee Gift (discounts apply for orders of 10 or more. They make a beautiful sun catcher as well as a Tree Ornament or Stocking stuffer . Orders of more than 3 may require SPECIAL ORDER, depending on what's currently on hand - expect to ship in 1-2 weeks from placing your order. Orders of less than 9 may ship sooner. 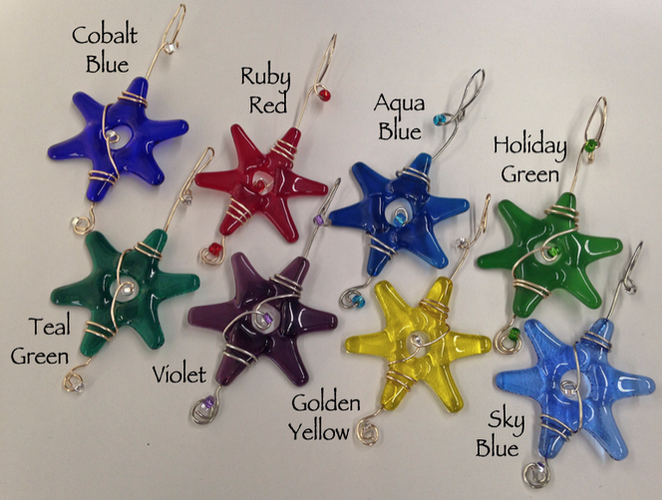 THIS 6-POINTED STAR is created with Red, Orange, Yellow, Green, Blue and Violet Spectrum 96 glass. It is wrapped with gold or silver (your choice) colored wire and embellished with sparkly color coordinated glass beads. It is ready to hang on your Christmas tree for the holidays, as a Hanukkah decoration or as a beautiful sun catcher in your favorite window at anytime of the year. *When placing your order message me with your wire color choice - Gold or Silver.